USA Technologies’ Support for Apple Pay Includes No New Terminals | NFC Times – Near Field Communication and all contactless technology. 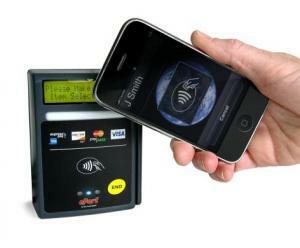 Despite an announcement Tuesday by USA Technologies, touted by Apple, of a nationwide rollout of 200,000 new acceptance points for Apple Pay, at vending machines, kiosks and other unattended or self-service points of sale, the terminals were already in place and available for contactless cards or other NFC-enabled wallets. NFC Times Exclusive – An announcement Tuesday by USA Technologies of a “nationwide rollout of (200,000) new acceptance points for Apple Pay” was merely a show of support for Apple's new payments platform, not a new deployment or upgrade to existing equipment, NFC Times has learned, and the vendor’s unattended point-of-sale terminals will continue to accept other forms of NFC and contactless payments. The 200,000 USA Technologies (USAT) ePort readers mentioned in the announcement, which was trumpeted by Apple CEO Tim Cook the same day during a conference call with financial analysts to bring home the point of growing acceptance of Apple Pay, had already been installed on vending machines, parking payment stations, unattended laundry machines and other self-service terminals, a USAT spokesman confirmed to NFC Times. Article has about 570 words.